PERSONAL HELLO , I AM FAN AND BRAND COLLECTOR AND HAVE 80 OAKLEY OAKLEY X METAL , among others MODELS AND ACCESSORIES OF MARK . 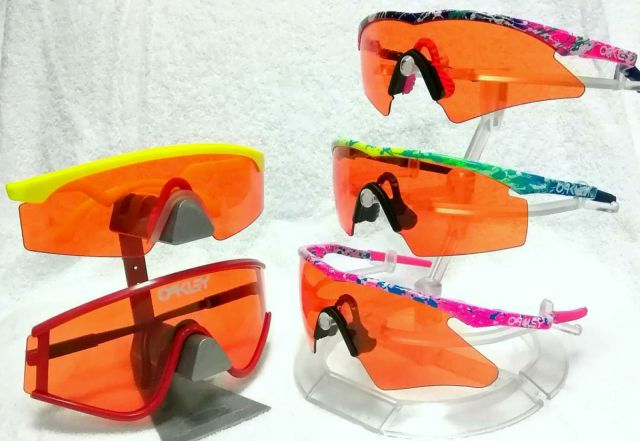 THANK COMMUNITY - REVIEW for letting me be part of this group WHAT DOES THE OAKLEY BRAND . Congratulations for the site , OFFERING ALL INFORMATION P / A TRUE COLLECTOR OF OAKLEY BRAND , JUST WONDERFUL THE TEAM'S WORK - REVIEW.PARABÃŠNS . Holbrooks very cool, was very harmonious .. Interesting design, plus one of the carbon family. EXACT DANN, ONE IS WITH OTHERS, ONLY SMALL VARIATIONS, BUT WELL. LATCH IS INTERESTING .THANKS DANN.. Thanks OAK for your help. I'll try on another notebook..VLW .. I have a TB 10TH ANNIVERSARY, and I can not open the blue ray in my notebook. I can only watch the same on blue ray device, or on the notebook also with you, how do I? Welcome back to the forum ,Brennan!! This is incredible, beautiful work. Rust lens was a substitute for persimmon before persimmons were sold. Rust exists only in hybrid, sweep, heater, 67 and strike. I have not seen rust of strip and V. I think rust changed into persimmons because it is a little dark.